Big check pictures are in! Plans are in place! 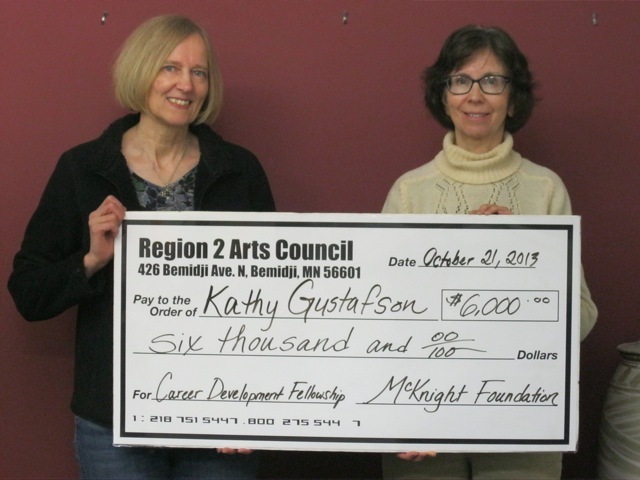 If you haven’t heard, back in October 2013, sculpture artist Kathy Gustafson and director/performing artist Cate Belleveau received McKnight funded Region 2 Arts Council Career Development Fellowships. 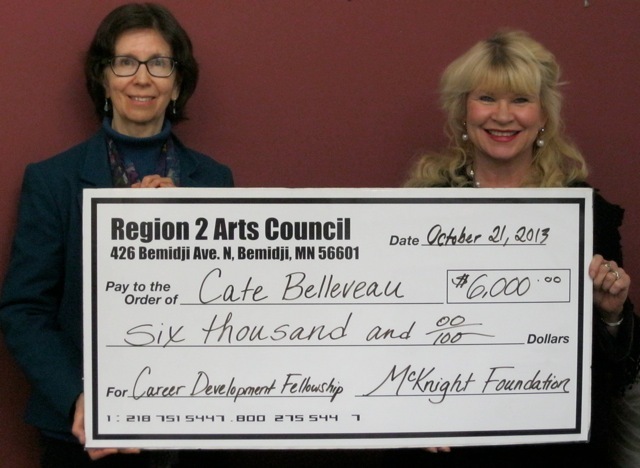 Cate Belleveau, of Puposky, a local writer, actor, director, teacher and founder of the Mask and Rose Women’s Theater Collective, was awarded $6,000 to attend the Network of Ensemble Theater’s National Summit and Dell’Arte International’s Summer Workshops. Her focus will be on physical theater, theater in a rural setting, and storytelling by using stories drawn from and shared by the community. She will create a local ensemble theater group to utilize these new skills and ideas that will perform at Belle Thalia Creative Arts Space. Kathy Gustafson, of Bemidji, a local painter, sculptor, artist career counselor for Springboard for the Arts and member of Studio Ten, was awarded $6,000 to incorporate metals such as stainless steel, copper, bronze, brass and aluminum into her sculptures. Her plan includes working with other local sculptors to learn hot metal/forging techniques and methods of applying patinas and finishes. Her Fellowship will result in a new body of work intended for public display. Belleveau and Gustafson were selected from a very competitive, extraordinarily worthy pool of Region 2 artist applicants. Look ahead to fall 2014 for another chance to apply! This activity is made possible by a Region 2 Arts Council / McKnight Career Development Fellowship Award.